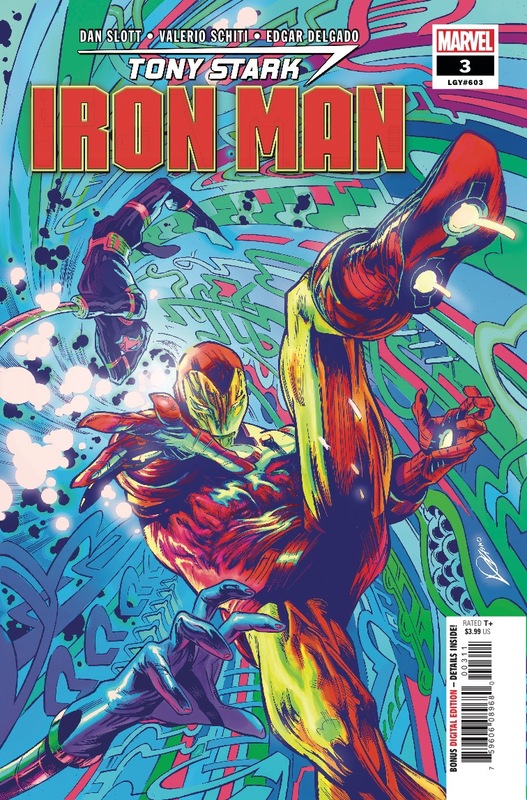 Tony Stark: Iron Man #3 Review – AiPT! Tony Stark beta tests The Great eScape! Since Dan Slott and Valerio Schiti took over Iron Man the character has felt limitless in potential. Gone are his familial issues and back is the spunky and fast-talking Tony Stark. The latest series has fleshed out his supporting cast, helping to further draw attention to the business Tony is building. That gets further developed in the issue released to comic shops today, but with the focus spreading across new characters, is it still good? This series has introduced a treasure trove of new ideas and interesting perspectives on technology. Tony is a futurist after all and Slott has put that to the test. One of the most intriguing, which gets developed further in this issue, is how computer A.I. have rights like any human does. Wait, is this the Oasis? One of the joys in this fresh start for Tony Stark is how he’s an inventor first. He’s also very happy to share these inventions with his friends and family who all take part in the beta test of an online reality called The Great eScape. The idea is to make this realm even more lifelike than real life itself, complete with A.I. characters who are so real you’d think they were humans too. This is the premise of holding things together in the narrative which carries Tony and his friends on an adventure that just has to be shaping up for a big let down. That let down is connected to the ever-growing menace who has been messing with Tony since issue #1, but also the full inclusion of Machine Man. Machine Man is a particularly interesting character in this issue since he’s closely connected to Jocasta (they’re dating). There are some serious issues to work out for Machine Man who is sick of humans stomping on robot rights. This plot in the series continues to be the heartbeat that keeps it interesting and it is explored in a heartfelt way that’ll tug at your heartstrings by the end of the issue. We also get a brief, and very cool, scene in a robot only bar that is filled with fun easter eggs, but also furthers the dilemma of robots not being equal. Schiti continues to render this world of Tony Stark’s in a style that has attitude and verve. The color by Edgar Delgado (with Rachelle Rosenberg) pops with color further making the book feel warm and filled with potential. Schiti is quite good at mixing foreground imagery with background imagery be it a sight gag or a dramatic detail further revealing the stakes in play. The Scape is slightly subdued in color helping to set it apart from the main story too. The very last page left me somewhat confused. Upon reflection, I think I know what Dan Slott is saying here, but it actually reads like all is well and there is no further discussion on it. That feeling is punctuated with a “The End” that doesn’t make sense either. As far as cliffhangers go I wasn’t on the edge of my seat or in the slightest interested in where we go from here because nothing is said about that at all. I assume the warm and fuzzies are a misdirection, but from how it is delivered it’s a head-scratcher to be sure. An enjoyable third issue ramps up Tony’s new toys but also the exploration of robots deserving rights like any person. The story has continued to interest me and the interesting new supporting cast shines through very clearly. An issue that furthers the interesting premise of robots requiring rights.